Tuesday's temblor follows an earthquake swarm over the past few days in the Hollister and Ridgemark areas of San Benito County. A preliminary magnitude-4.2 earthquake struck near Hollister Tuesday afternoon, according to the USGS. The temblor was reported just before 2:40 p.m. and was centered 11 miles south of Hollister. USGS officials say light shaking could be felt in the San Jose and Campbell areas. USGS data shows nearly a total of 53 earthquakes, with magnitudes of 2. 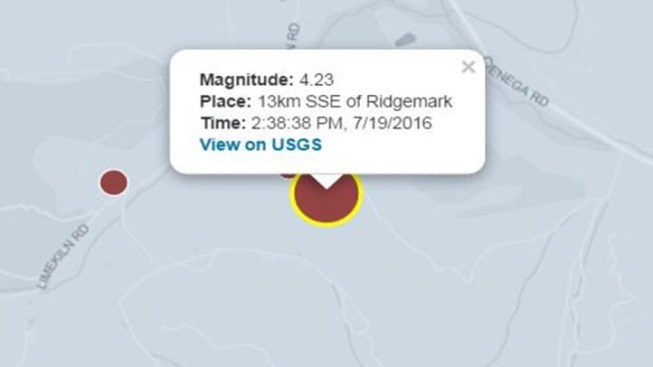 0 up to 3.8, striking both near Hollister and nearby Ridgemark in the last month. The area is about 50 miles south of San Jose and 15 miles south of Gilroy.